View photos of our garlic planting and growing. At Brant County Garlic Company one of our biggest priorities is to be dedicated to our customers. To expand upon just growing garlic and selling at festivals we now offer the following products for purchase online to our customers. For the 2019 Crop year, we have the following Fresh Ontario Gourmet Garlic and Added Value Products. 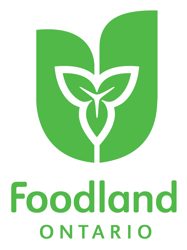 Fresh Ontario Garlic Scapes available by the pound, 15lb Boxes or Bulk Bins washed and quick cooled. Ontario Premium Gourmet Garlic available 4 bulb sizes by the pound, in numberous bag weights from 2lb to 60lb. Premium Seed available in 30lb boxes for any small to large acreage requirements. Please note any seed order over 1000lbs will receive University of Guelph Lab seed analysis report. We offer 3 Traditional Hardneck and 2 new French Softneck Varieties this year. All Garlic Seed Orders for the 2019 fall planting are taken on a first come first serve basis. Please order your seed requirements in early August. CALL US TODAY FOR PRICING or use the form below to REQUEST PRICING ONLINE. Our Premium Gourmet "GO-GARLIC" Dehydrated Slices are available in 50, 100, 200 and 400g pouches. Handy, ready to use and available 12 months of the year. These make a great gifts any time of the year, whether it is Christmas or a Birthday. GO-GARLIC Orders over $50 will receive Free Shipping! 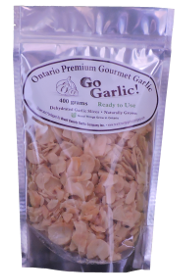 GO-GARLIC is Ontario Premium Gourmet Dehydrated Garlic Slices and is Ready to Use in Soups, Steps, Roasts, Goulash, Stir Fries, Gravies. Grind for Fresh Garlic Powder for seasoning or for your own meal creation. Please keep in mind two whole slices is equivalent to One fresh Clove of Ontario Garlic. Keep sealed and store with your other Dried Seasonings. This product iss available year round and excellent to use when Fresh Ontario Garlic is our of season. ENJOY! Copyright © Brant County Garlic Company 2012. All right reserved.